I recommend you serve this with the Mushroom Risotto in the previous post. My husband says there are only two ways to have shrimp, 1. Steamed in Old Bay and 2. Like this! I like to use large-sized (not jumbo), peel-on frozen shrimp. Always fresh and dependable. 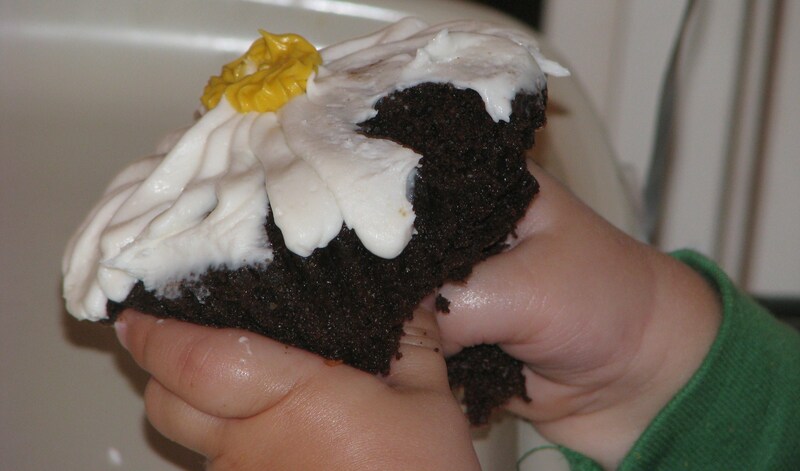 You may want to watch the red chili flakes if you’re making this for kids. However, mine didn’t seem to notice. They were too busy shoving them in. I used big cloves of Everblossom garlic, rosemary, and dried red pepper. Place the shrimp in a mixing bowl with olive oil, wine, 2 teaspoons salt, 1 teaspoon pepper and gently toss. In a small bowl, mash soft butter, garlic, rosemary, red chili, lemon zest, 1/2 teaspoon salt and 1/4 teaspoon pepper until combined. 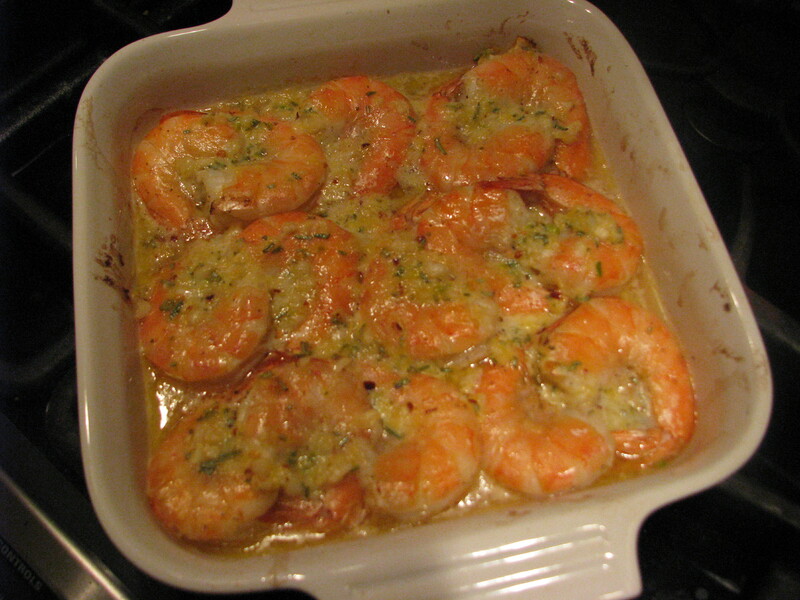 Arrange shrimp in a ceramic baking dish and pour the remaining marinade over them. Then spread the butter mixture evenly over the shrimp. Bake for 12 minutes until hot and bubbly. 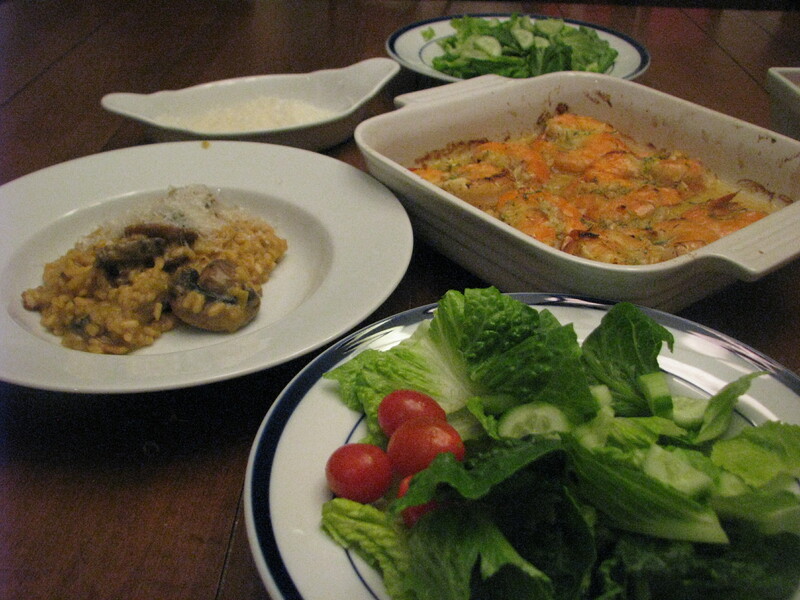 Risotto is not difficult to make, it just takes time standing at the stove as you regularly add the stock and stir. In this version, the turmeric adds color and the curry powder adds flavor, but stays in the background and doesn’t make this taste like a curry – just a creamy comfort food. My whole family liked it, even the baby. Plus, I could serve it to her as is…maybe risotto is just kind of sophisticated baby food. This pairs great with a spicier dish like my garlicky baked shrimp. I used an Everblossom leek, but you could also use two small onions. Heat the chicken stock in a small saucepan or in the microwave. In a heavy pot or Dutch oven, melt the butter and sauté the bacon and leek over medium heat for 5 minutes. Add the mushrooms and sauté for another 5 minutes. Add the rice and stir to coat the grains with butter. Add the wine and cook for 2 minutes. Add 2 ladles of chicken stock or pour about 1 cup into the rice plus the spices, salt and pepper. Stir and simmer over low heat until the stock is absorbed, 5 to 10 minutes. Continue to add stock 1 cup at a time, stirring every few minutes. Each time cook until the stock is almost all absorbed before adding more. Continue until the rice is cooked through, but still al dente, about 30 minutes. 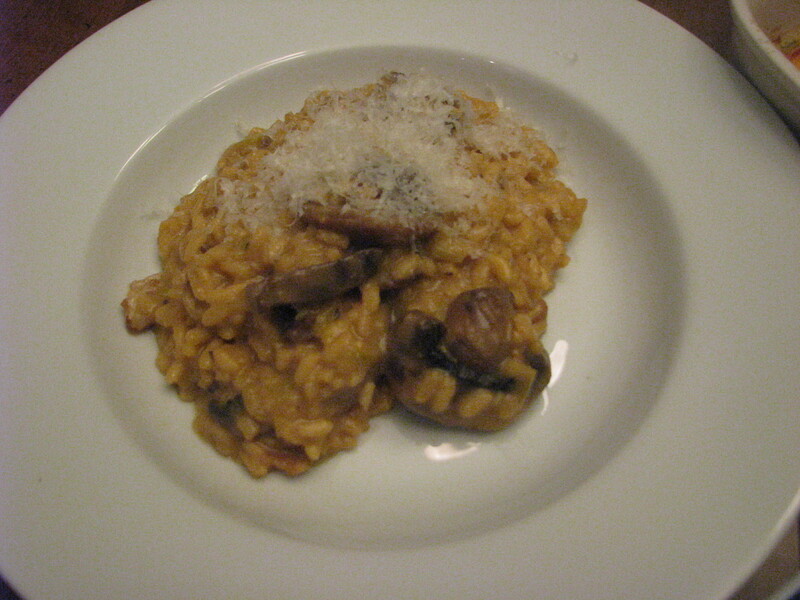 When done, the risotto should be thick and creamy and not dry at all. (If it is too dry, add another cup of hot stock). Off the heat, stir in the parmesan cheese. Serve hot with extra cheese.